Vuvuzelas - the horns used by football fans celebrating last year's World Cup - not only cause noise pollution but may also spread diseases, say experts. A short burst on the instrument creates a spittle shower similar to a sneeze, travelling at a four million droplets a second, a PLoS One journal study shows. 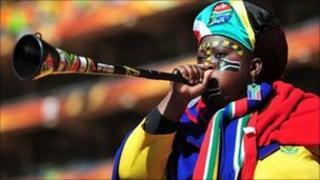 In crowded venues one person blowing a vuvuzela could infect many others with airborne illness like the flu or TB. Organisers are considering whether to allow them at the 2012 London Olympics. Critics say they are anti-social and unsafe because of their potential to generate a din louder than a plane taking off. Dr Ruth McNerney, who carried out the latest work at the London School of Hygiene & Tropical Medicine, said a "vuvuzela blowing etiquette" may be needed rather than a ban. "Just as with coughs or sneezes, action should be taken to prevent disease transmission, and people with infections must be advised against blowing their vuvuzelas close to other people," she said. Her team investigated the vuvuzela hazard using a laser device to measure how many droplets were produced by eight volunteers using the horns. On average, 658,000 lung particles, or aerosols, per litre of air were expelled from the instruments. The droplets shot into the air at the rate of four million per second. In comparison, when the volunteers were asked to shout, they produced only 3,700 particles per litre at a rate of 7,000 per second. "When attending a sporting event and surrounded by vuvuzela players, a spectator could expect to inhale large numbers of respiratory aerosols over the course of the event," Dr McNerney warned.